So this is the first time I've ever talked openly about Crazy Frog at Random.access, mostly because even though we are a relatively small website, I still think we're too good to even mention the mere existence of Crazy Frog. But considering this is being written during the holiday season, where we are to celebrate and enforce peace on Earth, I think it's fitting that we even accept Crazy Frog during this time of love, life, and harmony. And also so I can put this to rest and subsequently pretend this album doesn't exist. 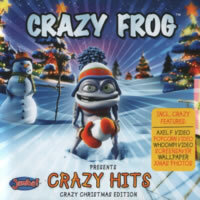 First off, let me just say that this is basically a re-packaging of Crazy Frog's original album, "Crazy Hits" (they got that title almost right), with a few new songs to more closely tie in to the whole Christmas theme. But really, it's mostly NOT a festive album at all. After a symphonic and incredible misleading intro, they waste no time in beginning the massacre with a holiday classic: Jingle Bells. The chimes ring, some autotuned guy yells "It's Christmas", and then it hits you like a brick: that high-pitched "Bing!" sound the frog makes over the melody of Jingle Bells. I think Crazy Frog's picture is in the dictionary under "hokey", and this song is the primary example. Sweet mercy, I've heard toilets make more palpable music. These songs might be legitimate if the Crazy Frog sound effects weren't involved at all. If you pretend they don't exist on Last Christmas, it's actually not half as blasphemous. They use a female R&B-style vocalist that isn't half-bad, and when the frog is out of the room, it's a fun dance rendition. But he's never far ENOUGH away and that "BUM! BUM!" sound effect sneaks in. Luckily, it doesn't happen often, and I can actually enjoy this Christmas carol in peace while swaying on the couch like an awkward teenager at a school dance. And that pretty much covers the Christmas part of this album. The rest is just regular dance music starring our least favourite amphibian on Earth, bumping Lester the Serial Murderer Toad from the top spot. We've got quite a list of cover versions here, including the butchering of M.C. Hammer's U Can't Touch This, which is actually new to the album as well. They mixed some electro elements and a lot of frog noises that no self-respecting frog would actually make with the rapping lyrics we all know and love, sort of. They got a studio rapper to take care of this; nope, not even the clearly available M.C. Hammer himself wanted to take part in the Crazy Frog project. Afterward is Axel F, probably the most well-known Crazy Frog song, based on the Harold Faltermeyer theme from the movie Beverly Hills Cop. Insert theme with more modern-sounding synths... and "Bing! Bing!" I love this melody, but with the overuse of Crazy Frog's "bings", "bongs", and "bums", it really cheapens the experience, especially when he just decides to have a nervous breakdown halfway through. There's an electro-dance cover of Popcorn, the song made popular in 1969 but revived for the purpose of commercializing a phone company's frog mascot. And heck, he's not even really a frog anyway, making this entire project and album moot. Goodnight, people. ...Er, anyway, this version of Popcorn wouldn't be quite so bad if, as usual, that frog creature would stop shouting "chicky-chicky-bow-wow" and all that nonsense. I mean, this song would still be corny-sounding as heck, but at least I wouldn't be half as embarrassed to play it in public. As long as we're taking a hot poker to the classics, let's add a little jungle rhythm to the mix and slice up Whoomp! (There It Is). Next is 1001 Nights, a mixture of Arabian recorders and what I think to be the beat and bass behind 50 Cent's first major hit. I don't think it's a cover of anything, and I hate to say that this may be a highlight of the album. People just might be able to breakdance to this without being pointed at and taunted with laughter, hurled insults, and faster hurled rocks. If you put the right beat to any song, it can be listenable. But don't expect that trend to hold strong, as even the already-cheesy Vengaboys weren't safe from a Frog overtaking of We Like To Party, replacing the first lyric "The Vengabus is coming" with "The Crazy Frog is coming". I wish she said that he was going. Away. Far away. Into a coffin. Don't You Want Me is a bit more of a subdued synthpop track, coated with a female sample of "don't you want me, don't you want me, don't you want my love". The organ stabs reminded me of the classics from the early 1990s... and it turns out I wasn't far off, as it was originally a 1992 song by Felix. And then... Dirty Frog. ...What? I'm not sure if this is a cover or not, but it's just a lot of beeping and buzzing of a slightly jazzy bassline while the frog "Bam!" effect pops up from time to time to irritate all. What we need now is a Magic Melody, and we get one! The initial beats and claps made me think this was going to be a Pussycat Dolls song, but nope, it's just an average song with a decent chiming melody dampened slightly by... you guessed it: the FROG FROM VALHALLA. At this point, I felt as though there wasn't enough influence from the past. (Sarcasm detectors everywhere are seeping smoke from their internals.) Thank goodness for a Crazy Frog cover version of Pump Up The Jam, originally made extremely popular by Technotronic in 1989, but then remade in an unnecessarily redundant fashion by changing relatively little. It's slightly more modern, but really, it's a cash-in. But let's go back even further in time. I'm talking about In The 80s, pulling the sounds of 80s synthpop past. I know the frog character is trying to sing about something, but I don't think he's using actual words. His inclusion is a shame because the song itself doesn't sound that bad. Generic, yes, but worthy of existence with dreamy pads and a pretty solid groove overall. If they had used ACTUAL HUMAN SPEECH, this song could have been an earworm instead of an ear TAPEworm. Who Let The Frog Out? Did we NEED a cover of this? No, we didn't. Did we need the ORIGINAL version of this to exist? No, we really didn't. This one's more dancy with additional background melodies absent from the Baha Men's edition, but still, if I never hear this chorus again in my lifetime, I'll die a happy man. And I'm not sure what Wonderland is about; it's a mix of minimalism and acid techno, the latter genre being one at least one member of the team behind the music project, Reinhard Reith (also known as DJ VooDoo, half of Voodoo & Serano), knows very well. It sounds like, well, all of his early hits, especially "Blood Is Pumping". If you love acid house and acid techno music, this one's actually good to listen to. Why it's called Wonderland is unclear; maybe this is just the embodiment of a fantasy world hidden on the disc where good music can actually be found. And why not toss the theme song to the movie "Dallas" on here for kicks? There's no need for any song on this planet to remain sacred when Crazy Frog's on the case! Thus spoke Crazy Frog, and Dallas (Theme) was born, a cheesy electronic cover loaded to the brim with Crazy Frog grunts and groans. Very expected, and also very unwanted. Two more songs litter this turdly cornfest: the cover of Get Ready For This, originally by 2 Unlimited back in 1991, and the even less lovable take on the Reel 2 Real hit I Like To Move It, both of which have been only minutely updated in sound and then burnt to a crisp in ruin by adding bubbly frog noises. And just to drill it into our heads, someone had the nerve to include Crazy Sounds (Acapella), a collection of all the Crazy Frog sound effects, isolated from any music, so that we could truly experience the pits of Abaddon. Stop. Don't look. And DEFINITELY don't listen.